As part of Artecnica's Design with Conscience project, the Homeboy Tote Bags are rooted in humanitarian and environmental principles. The canvas totes feature original calligraphy created and screen printed by ex-gang members in Los Angeles with resources provided by Homeboy Industries, the largest gang intervention program in the U.S. With the help of graphic designer Alex Lin, the bags are also part of Artecnica's Design with Conscience project, a series of products rooted in humanitarian and enviromental principles. 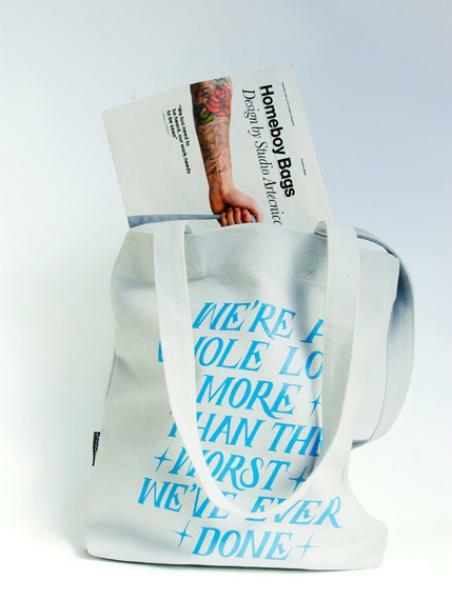 The Homeboy tote bags feature five different slogans by Homeboy Industries' founder, Father Greg Boyle. The text is graffiti-and tattoo-influenced calligraphy by former gang members. Homeboy tote bags are 14.5 inches by 13.5 inches, large enough for a trip to the farmers market or local grocery store.